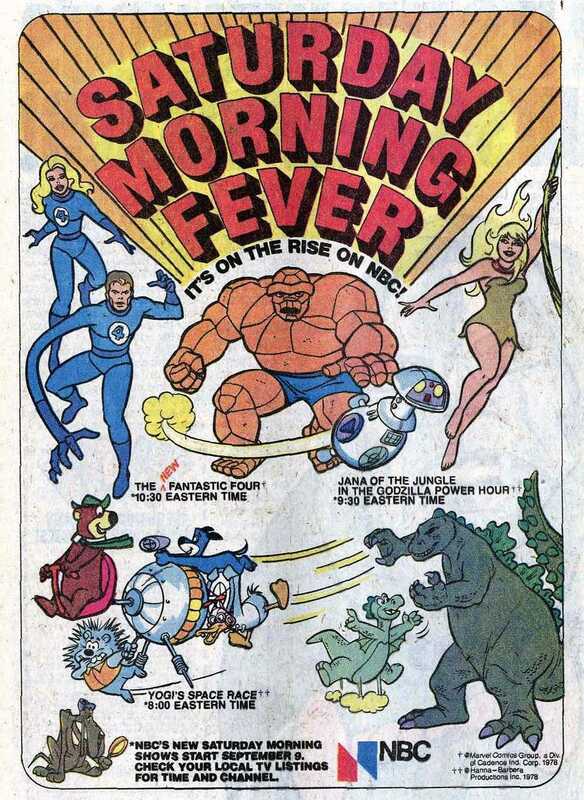 While rifling through more comics and comic scans I’ve managed to come across a few more cool Saturday Morning Cartoon ads from the mid to late 70s, so I’ve put them together as a sort of addendum to the Essential Saturday Morning Cartoon Ads, 1979-1989, which will partially cover 1976-1978. 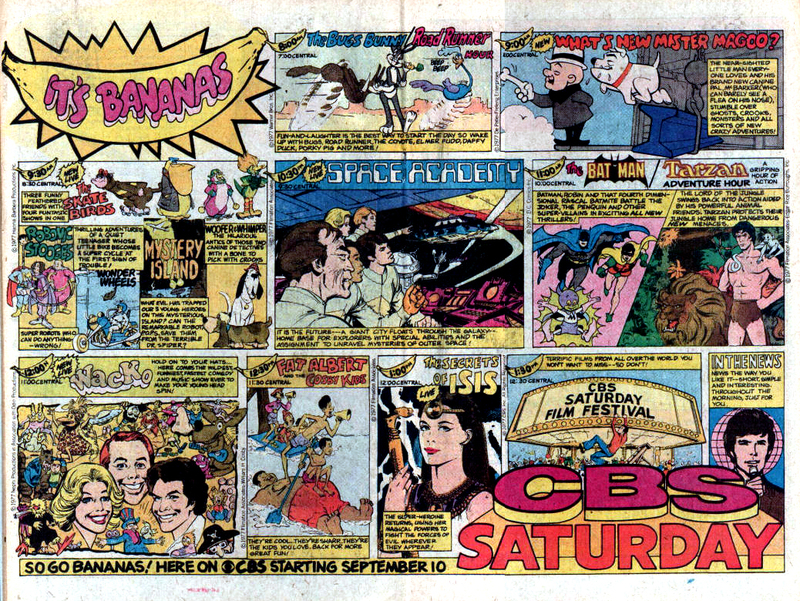 First up we have this pretty cool CBS ad from 1975. 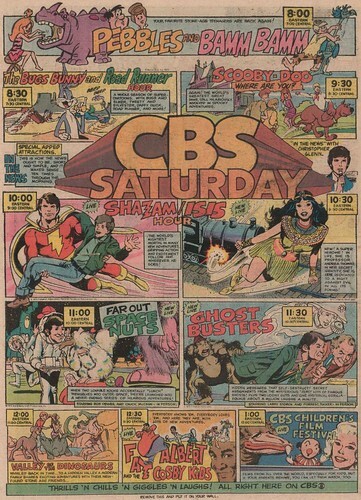 This is the beginning of the short lived period of live action Filmation Saturday morning shows with the introduction of the Ghost Busters, a show that I’ve talked about here before. There’s also a weird show called the Space Nuts starring Bob Denver which just has me scratching my head. Rocky Mountain High in space apparently, but nutty. Weird. This is also the year that the Mighty Isis debuted on TVs across the nation. 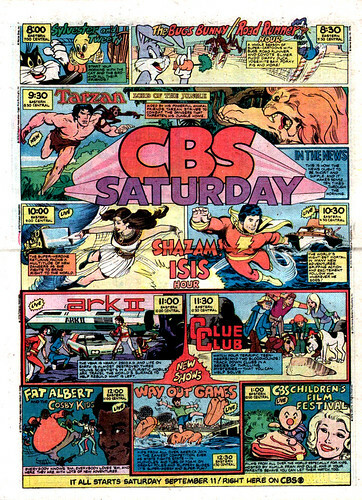 Next there’s another CBS ad, this one from 1976 which is very similar the 1975 ad but with Isis and Shazam flying in the opposite directions. This ad also announces the first of the three live action Filmation sci-fi kids shows, Ark II, which I think was about a sort of futuristic Ark which was manned by a crew collecting/protecting flora and fauna specimens. 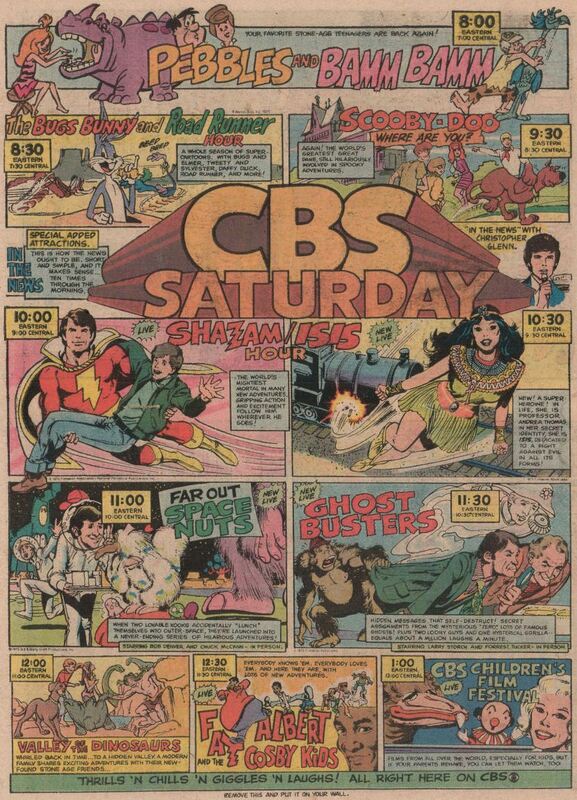 This time line of shows actually feels a lot like how I remember watching Saturday morning TV as a kid, starting early with the Looney Tunes, and then progressing until later in the day there were variety or sports-like shows. 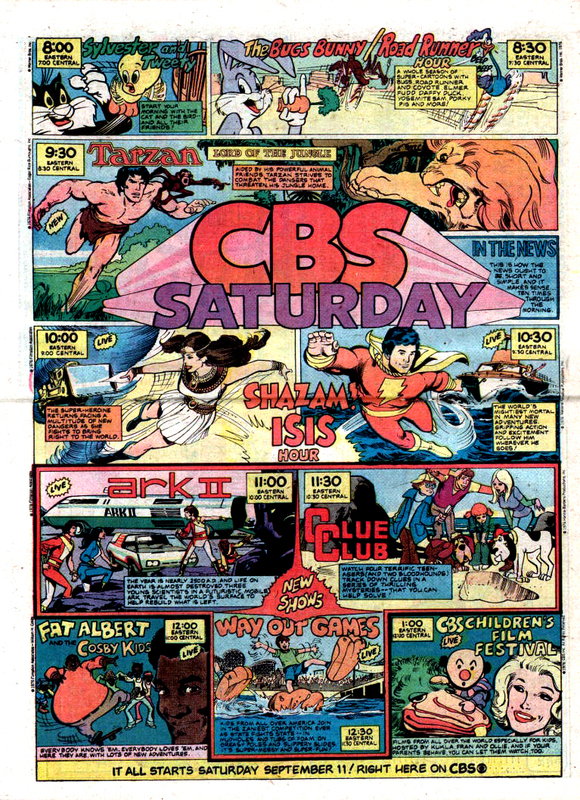 This next ad is from the following year (1977) and is also from CBS. I have no idea why CBS chose to go with a bananas theme for this ad, no idea what so ever. 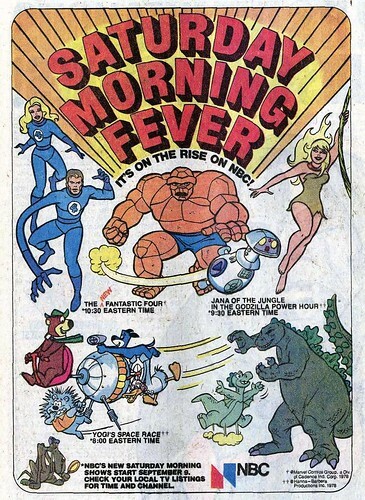 1977 would bring us the 2nd live action sci-fi show from Filmation, Space Academy (the 3rd was Jason of Star Command which you can see in the other SMC ads that came later.) I’ve actually sat down and watched most of the Space Academy show which is pretty campy but still a lot of fun. I’m so glad that BCI is putting out all of these Filmation shows on DVD as it’s given me a chance to see what it was like on Saturday morning before I was watching. This year also saw the beginning of the Batman cartoon, also by Filmation I believe, and also coming out on DVD soon through Warner Bros. 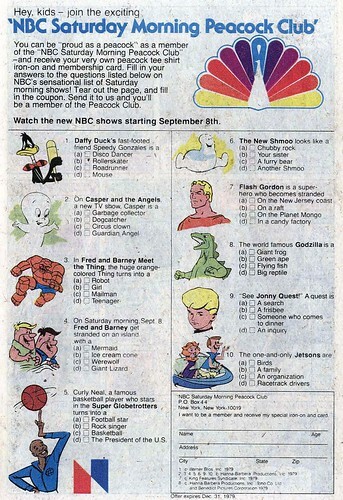 In this ad Shazam was dropped from the schedule though Isis was back for more with a second season. So what in the hell is that weird creature in the Batman portion of the ad? It looks like a cross between Bat-Mite and the Great Gazoo. 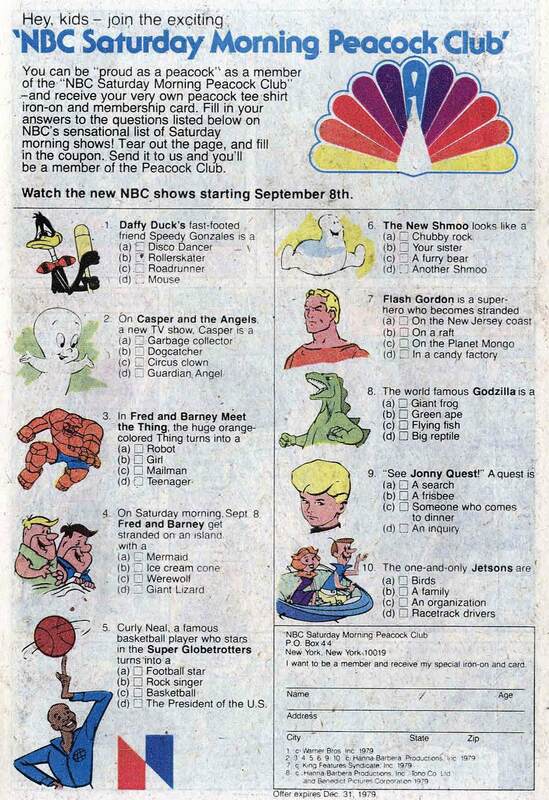 This last ad is from NBC in 1978 and is broken up into two pages, one announcing the shows and one with a little trivia quiz. Apparently crime solving dogs were all the rage in the 70s between Scooby Doo, the Clue Club from the 1976 CBS ad, Woofer and Whimper from the 1977 CBS ad, and now this sleuth looking dog from the 1978 NBC ad. 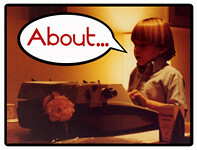 I think somewhere I also have one NBC ad from 1968. I’ll have to dig that out and add it to this list. Also if anyone out there has any other ads from this period, 1975-1990 or so and you’d like to donate a scan, please let me know. I think it would be pretty cool to have a nice complete set of these to provide a nice cartoon time line. Also, if anyone has any scans of the ads that ran in TV guide, that would be awesome as well as I’ve never seen any of those. Return of the 31 Days of Monsters, Day 25: When Giant Mantids Attack! I’ll be at the Atlanta Comic Con this Sunday with Branded in the 80s!